Cash Wenick, six foot seven inch post for Grant Union towered over all the other players during the game on Saturday. 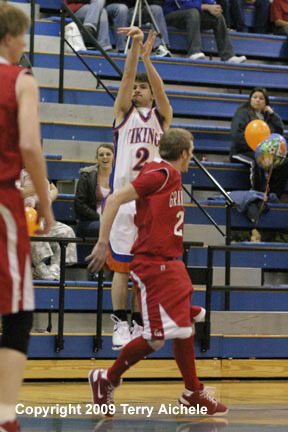 UMATILLA - The Umatilla Vikings (4-2) defeated the Grant Union Prospectors (5-1) 47 to 31 on Saturday, February 7, 2009. The Vikings found a way to claw back from being down as many as 10 points to take the win. It looked like the game was going to be extremely low scoring with G.U. leading at halftime 21 to 15. Over the course of the season Umatilla has found the ability to battle back and win hard fought games. 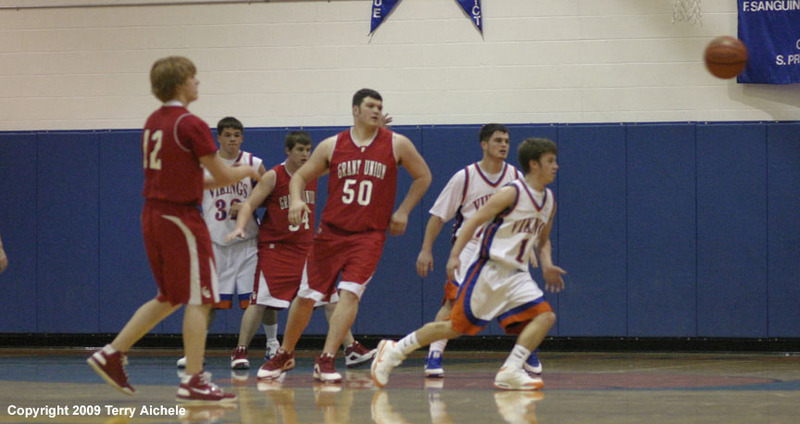 The comeback looked like it would be difficult when 6'7" Grant Union post Cash Wenick was on the floor. Wenick and Ian Averett the other Ourlaw post had between three to five inches over the corresponding Viking player. The Prospectors held the Vikings scoreless for the opening four minutes of the first period. A technical foul on the GU bench for Wenick not being in the player book gave Levi Russell of Umatilla their first point. Russell then scored on the inbound hitting a three pointer to close to 4-7. Austin Bieren hit a shot and a freethrow to bring Umatilla to 7-11. Russell hit another shot giving Umatilla nine. At the end of the first Grant Union led 11 to 9. G.U. outscored Umatilla ten to six to take a 21 to 15 lead at halftime. Ruben Navarrete fired up the crowd with a steal and layup. Others scoring for the Vikings included Taylor Pankey and Russell. Umatilla held the Prospectors scoreless for the first three and one half minutes of the third period. Steve Williams closed in on the Outlaws when he was fouled on a three point attempt. He sank all three freethrow shots to close the Vikings to within one, 20 to 21. Navarrete gave the Vikings their first lead with 3:22 to go in the third. It was short lived but the Vikings regained the lead at 24-23 on a shot by Nathan Creason. Outlaw Dalton Moore hit a freethrow to tie it back up at 24. Umatilla took control in the fourth period leading as much as ten points at the midway point. Vikings scoring included Peter Stice, Navarrete, Russell, and Bieren. A scoring spurt by the Vikings and holding the Prospectors scoreless for nearly four minutes gave Umatilla a 16 point lead. The Vikings and Prospectors are now tied at 5-2 just behind first place Nyssa Bulldogs at 5-1. The Vikings will travel to Riverside for a game on Friday, February 13. 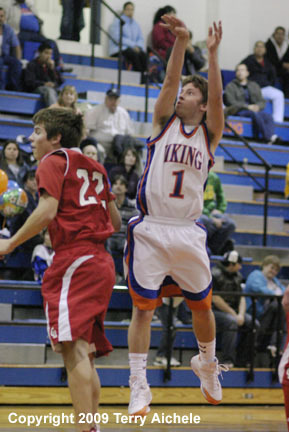 LEFT - Umatilla's Steve Williams takes a shot over a Grant Union defender. 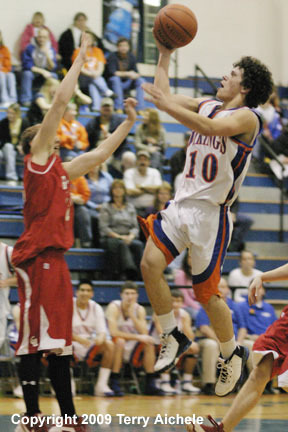 RIGHT - Nathan Creason of Umatilla tosses a bounce pass around a Grant Union defender. 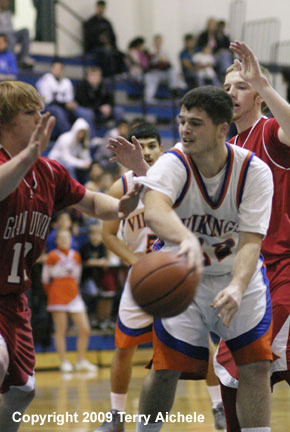 LEFT - Viking Levi Russell takes a shot over Cody Williams of Grant Union. 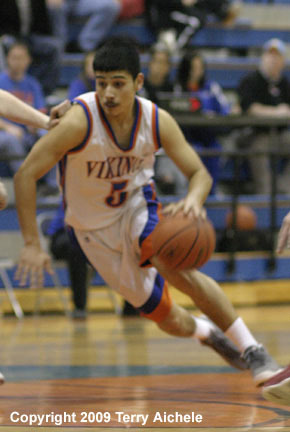 RIGHT - Ruben Navarrete of Umatilla drives towards the basket. 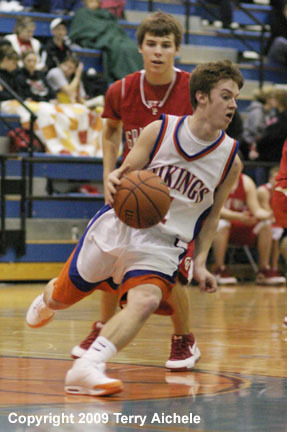 LEFT - Viking Levi Russell drives around a Grant Union defender. RIGHT - Peter Stice of Umatilla drives to the basket.